Family friendly geocache located in Grove Park, 42 Grove Avenue in Verona, New Jersey. This cache can be retrieved directly from the trail. The Verona Environmental Commission (VEC) placed this geocache along the municipal trail in Grove Park, a 1.33 acre Historic Park and Nature Preserve open to the public from dawn to dusk. 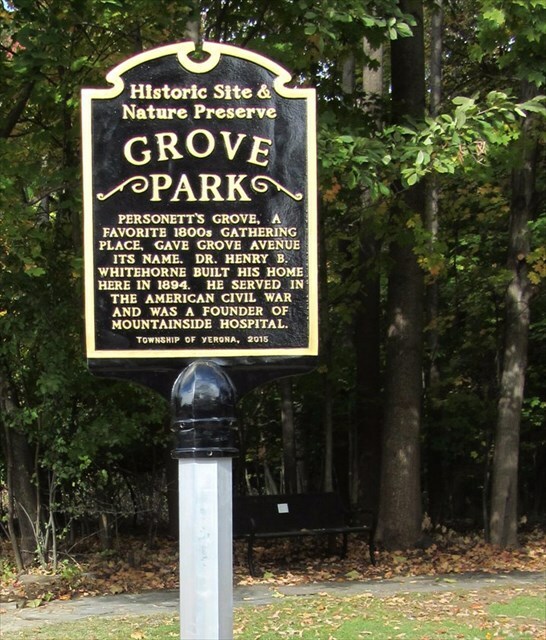 Grove Park is maintained by the township with help from the VEC and community volunteers. Volunteers donate their time to help keep our open space safe and healthy for wildlife and for people. Hikers come across deer and often see rabbits, squirrels, chipmunks, groundhogs, raccoon, wild turkeys, many birds such as red-bellied woodpecker and an occasional owl or red fox. Vegetation includes a big patch of skunk cabbage and jack-in-the-pulpits, native sycamore, black cherry, hickory, tulip poplar, dogwood and red maple trees. This property was settled by the Personett Family in the mid 1700s. A stand of trees here took on the name “Personett’s Grove.” In the early 1800s this had become a favorite meeting place in the community and it gave Grove Avenue its name. Dr. Henry B. Whitehorne, the namesake of Verona's middle school, built his home on this site in 1894. The house was destroyed by fire in the 1960s but the structure of his lily pond is still there.